Some plants are bold. They would like nothing better than to be planted in the middle of the garden, flailing their leaves, emitting impossibly sweet fragrances. Others are more secretive, more sinister, skulking in dark places and hidden ways, hoping to be overlooked by humans while they continue with their mystifying activities. And then there are the ones that exude a gentle style and grace, relying on complicated patterns of quiet beauty to win your favor. I once watched Marco Polo Stufano being interviewed while he was still the Director of Horticulture at Wave Hill Botanical Garden in New York City. It took place in the gardens, naturally, and Marco gave a tour of plants currently in bloom or that were personal favorites. At one point he halted the tour by the side of a bed of bearded iris. It was a mass planting of antique varieties filled with blossoms of pale tans, pearl grays, and palest lilac, among others. He described them as tea stained and his obvious love for those plants encouraged my awareness of flowers with similar colorations. 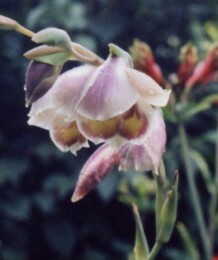 This is our plant of Gladiolus papilio, the butterfly gladiolus. It has thinner and grayer leaves than the hybrid types but produces many more cormlets (baby corms) as if making up for it. It is not hardy in the northern climes so it must winter over in a frost-free area during the winter. But we donâ€™t mind because the flowers are special. On a creamy white background, the interior of each floret is washed with silvery purple in a tracery of color as if painted by a master. The flowers nod down, knowing a demure attitude is always more alluring. My wife and I received our plant as a wedding present from Maggie Wych of Western Hills Nursery in Occidental, California. A remarkable woman blessed with charm, grace, talent, and ribald humor, Maggie has always been one of our favorite plantswomen. Our little butterfly is in bud now, and when the flowers open we will remember the special spark Maggie ignites in everyone she meets.